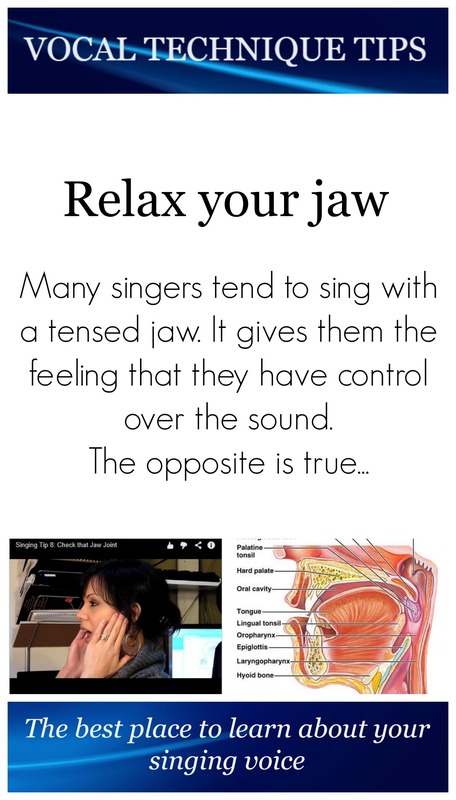 Many singers tend to sing with a tensed jaw. It gives them the feeling that they have control over the sound. The opposite is true because there are many muscles that connect the jaw and the throat. Some of them pass your larynx. When these muscles are tensed, they will put pressure on your larynx and prevent your larynx from moving freely. Make sure you do not push your jaw forward. It should be completely relaxed. The video shows how to make sure how to open your jaw properly. Many singers use their lower jaw to pronounce words. The tip of the tongue and your lips should be active while speaking or singing, not the lower jaw! While singing your jaw will move in a relaxed way when you use the tip of the tongue and your lips to pronounce. A good way to check the tension in your lower jaw is to place your index finger behind your front teeth in a way that the palm of your hand does NOT point toward you, it should point to the side. Now start to sing. Your lower jaw should be completely relaxed and not bite your finger! 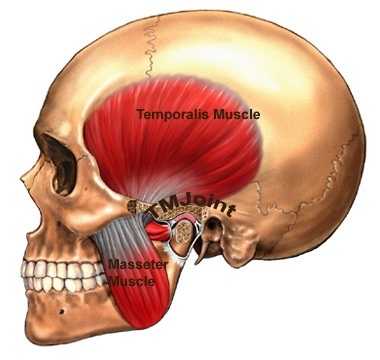 When you tend to bite your finger, the muscles in the picture below become active. Try to relax them! If you are having problems relaxing your jaw, voice lessons, speech therapy or physical therapy may help you to solve the problem. Train the relaxation of your lower jaw on a regular basis. It will improve your sound!